Family…. 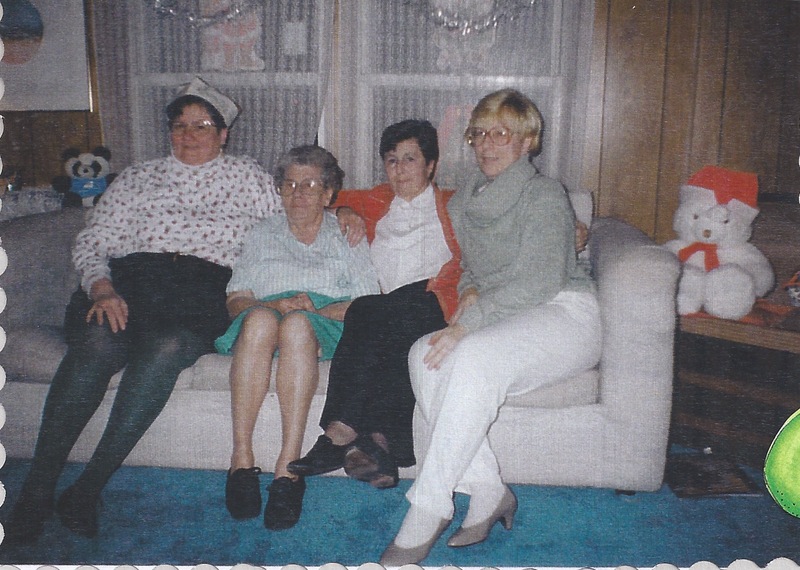 that is what today’s blog is all about – Elsie (on the far right) was my mom’s baby sister. An amazing woman who taught me about courage, willpower and the importance of never giving up on your dreams. Elsie was about 9 years old when I was born. She was glad that there was someone new to be the “baby” of the family. Little did she know that as she grew up, she would have to drag me with her. I am sure that she dreaded it until I grew up – well when I go to high school which was when our relationship started to change. It was then that I shared some of my deepest secrets with her. Fast forward to about 1980 when we traveled to Atlantic City for new jobs at the Claridge Casino Hotel – we were each others support systems. When I had Belinda – she became Belinda’s buddy. To most, Elsie was shy, quiet and very seldom stepped out of her comfort zone. She was caring and faithful, always ready to help someone in need. After her first mastectomy, Elsie showed what a fighter she really was. She went back to work. She worked through the side effects of the medications and never wanted to be pampered. It was then that she was my support system as I struggled to get clean from drugs. She showed me that if I really wanted something – I had to fight to overcome the naysayers, the Negative Nellie and the Tempting Thomas. She didn’t judge me for my mistakes, she showed me how to use them to help others. I am sure she never really knew the impact she had on me during that time. The struggles were a little tougher with the second mastectomy, fear started to creep in BUT she didn’t let it stop her. Elsie had a dream – owning her own business. After the second surgery she took a leap of faith. She moved back to Ocean Grove and opened Small Wonders – a gift boutique. She really wanted to a bed and breakfast and she hoped that Small Wonders would be a stepping stone to that dream. DREAM BIG and she did. As the cancer caused her to loose the majority of her sight, she continued to go to work each day. She knew the layout of the store, she had helpers who stopped in and she continued to work as if nothing was wrong. Those closest to her saw the changes but as long as she wanted to fight – we were there to support her. Then on Memorial Day weekend of 1999, Elsie gave up her will to fight. She had just returned from a trip with friends and told us that this was the end. Not something we wanted to hear but we knew she had fought long and hard. I have so many memories but her strength stands out the most. Her fight, her commitment to our family and her ability to dream big are what help me to keep going when my faith starts to waiver. I DREAM BIG and hold fast for I know that in God’s time, my Weston angels will help me to reach my dreams and my goals. I step out of my comfort zone and I know that she is right behind me cheering me on.